Hemanta Mukherjee was born in the holy city of Banaras,India. His family migrated to Calcutta in the early 20th century. Hemanta grew up there and attended Mitra Institution school of Bhawanipore area. There he met his longtime friend, Subhas Mukhopadhyay who later became a Bengali poet. After passing the intermediate examinations (12th grade), Hemanta was admitted to Jadavpur University to study Engineering. However, he quit academics to pursue a career in music, despite strong objections from his parents. He briefly tried his hand at literature and also published a short story in a prestigious Bengali magazine called Desh, but by the late-1930s he was committed entirely to music. 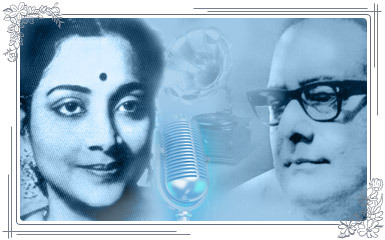 Under the influence of his friend Subhas Mukhopadhyay, Hemant kumar recorded his first song for All India Radio in 1933. Hemant kumar's music career was mentored by the Bengali musician Sailesh Duttagupta. In an interview on television in the early 1980s, Hemanta had mentioned that he had also received training in classical music from Ustad Faiyaz Khan, but his tutelage was cut short by Ustad's untimely death. In 1937, Hemanta cut his first gramophone disc under the Columbia label.. Thereafter, every year Hemanta continued to record non-film discs for the Gramophone Company of India (GCI) till 1984. His first Hindi songs were kitana dukh bhulaya tumne and o preet nibhabewali, released in 1940 under GCI's Columbia label. Music for these songs were composed by Kamal Dasgupta, lyrics were by Faiyaz Hashmi. Hemanta's first film song was in the Bengali film Nimai Sanyas released in 1941. Music for this film was scored by Hariprasanna Das. Hemanta's first compositions for himself were the Bengali non-film songs katha kayonako shudhu shono and amar biraha akashe priya in 1944. Lyrics of these two songs were by Amiya Bagchi. His first Hindi film songs were in Irada in 1944 under Pt. Amarnath's music direction. Lyrics were by Aziz Kashmiri. Hemanta is considered a foremost exponent of Rabindrasangeet. Hemanta recorded his first Rabindrasangeet disc in 1944 under the Columbia label. The songs were prangane mor shirishh shakhay and he nirupama. His first movie as a music director was the Bengali film Abhiyatri in 1947. Although many of the songs Hemanta recorded in during this time received critical acclaim, major commercial success still eluded him, right until 1947. Some contemporary male singers of Hemanta in Bengali around that period were Jaganmay Mitra, Robin Majumdar, Satya Chowdhury, Dhananjay Bhattacharya, Sudhirlal Chakraborty and Talat Mahmood. As a composer he shifted base to the Mecca of national popularity (Bombay) where he made an instant impact with the everlasting patriotic strains of 'Vande Maataram..' in Anand Math. As a singer in Bombay, Hemantda became a voice to record with in 1952 when he sang of 'Ye Raat Ye Chandni Phir Kahan..' in the thriller Jaal for the debinair Dev Anand. In 1957, Hemantda sang one of his career's best solos 'Jaane Wo Kaise Log The..' for Guru Dutt in Pyaasa. Songs like these branded Hemant Kumar as the melancholic romantic. However there was a lighter equally persuasive side to Hemantda's vocals tapped in flirtatious evergreen like 'Zara Nazron Se keh Do Ji..' and 'Dil Ki Umangen Hain Jawan..' the duet with Geeta Dutt which joyfully exemplifies the vocal genius of Hemant Kumar. 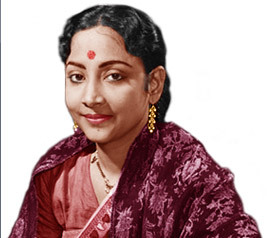 Geeta Dutt and Hemant Kumar both hailed from the land of Bengal. Both sang about 30 songs together under the baton of seven music directors. Some of these went on to become all-time blockbuster hits, including 'Mujh ko tum jo mile' from 'Detective', 'Gumsum sa yeh jahaan' from 'Duniya Jhukti hain', 'Jab se mile' from 'Amaanat' apart from others like 'Jai jagdish hare' from 'Anand Math' which enjoy a cult following. Then there were those ever popular slightly-westernized songs, 'Oh oh oh Baby' from 'Police' and 'Aaja zara mere dil ke sahare' from 'Ek Jhalak' which were equally charming. But a lot of great music they did together did go unnoticed. With these less fortunate songs was lost a bequest of luminous, resplendent and outstanding music. 'Do naina tumhare pyare pyare' from 'Shrimatiji' immediately comes to mind. The movie bombed at the box-office, and its music relegated to the dark nooks of oblivion. 'Yeh mast nazar, yeh shokh hawa' from 'Bandi' and 'Qarar jisko na aaye' from 'Lalten' suffered similar fate. One can only rue the segregation of these equally delightful but lesser known songs. Almost equally unfortunate is the fact that some of their songs, great indeed they were, were never released for the audience to lay their years on! 'Insaaf kahan hai' had lovely songs like 'Hey babu hey bandhu' and 'Tujhe du main kya yeh tum hi bata' exemplify such travesty. Apart from their duets, a mention should be made, even out of context; about the (tandem) solos they sang. 'Na yeh chand hoga' from 'Shart' and 'Jiye to kaise jiye' from 'Baadban' are rare examples of instances when a female voice sounded equally impressing, if not much better, compared with the male voice. Not to belittle Hemant Kumar, Geeta's versions had such aching vulnerability in the voice that made one want to weep for her and with her. This was the magic in Geeta's voice; a voice that could traverse such a complex range of emotions with boggling ease and spontaneity. Geeta and Hemant made an amazing pair. Their vocal timbres were unique in their own ways, yet they complemented each other beautifully. 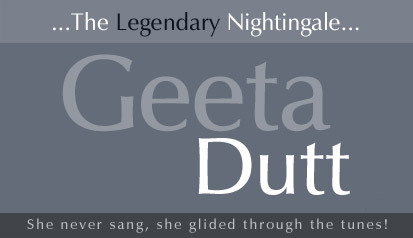 While Hemant's voice had staidness and solemnity, Geeta's voice was ever refreshing and oozed exuberance. One only wonders why their association was so limited in terms of the songs they sang together. For fans like us, those three-four minutes of their union were minutes of not-to-be-missed savory delight.